As if England’s less than emphatic win against Argentina wasn’t enough of a headache for Martin Johnson, he’s now without experienced prop Andrew Sheridan for the rest of the Rugby World Cup. The 31-year-old aggravated a shoulder injury in England’s 13-9 victory over the South Americans on Saturday and, after experts in England studied scans of his shoulder, he was advised to fly home. It’s a bitter blow for Johnson’s men who face Georgia on Sunday in Dunedin. 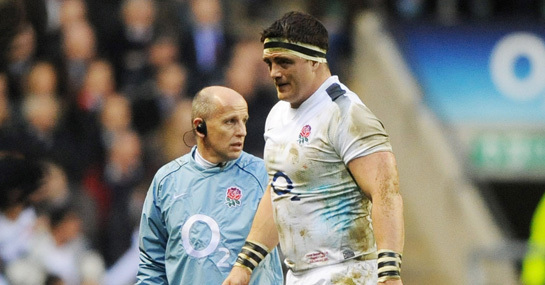 Speaking to the RFU, Johnson said: “It’s really sad for Sheri. He has been unlucky with injuries and we wish him all the best for his recovery. As the only specialist loosehead in the squad, Alex Corbisiero looks set to make his World Cup debut in place of the Sale man. England have remained steady at 16/1 to win the World Cup in spite of this latest setback. Meanwhile, hosts New Zealand have their own injury concerns with talisman Dan Carter being ruled out of their second Pool A game against Japan on Friday. The fly-half reported suffering from a stiff back after New Zealand’s victory over Tonga and has withdrawn from the squad to face a tough Japan side. It’s a precautionary measure though and Carter should be fit to face France next week. The absence of Carter will be disappointing to the paying punters in New Zealand, but it shouldn’t make any difference to the outcome of their game against Japan. New Zealand are an absolutely tiny 1/750 to beat Japan.